Digestive disorders are frequent after birth and during transitory feeding periods, particularly weaning. These can trigger dehydration and the development of pathogens in the intestine, which rapidly compromise the integrity of the gut wall. The development of intestinal villi is significantly impacted, reducing the absorption of nutrients and undermining the benefits of feed. The algae extract selected for its marine sulphated polysaccharides stimulates the secretion of mucins in the protective layer of intestinal mucous, boosting the gut’s natural defences. Micronized clays help protect the gut wall mechanically. Clinoptilolite traps ammonia ions to delay the development of intestinal villi. • Ecopiglet protects the intestinal villi. • Ecopiglet retains water in the digestive system. • Ecopiglet is rich in trace elements. Ecopiglet is designed for use from the fifth day of life until weaning to promote feeding. It can also be distributed as a liquid in troughs by adding water. - From day 1 to day 5: mix a scoop of Ecopiglet with a litre of milk or water at 40°C. - From day 5 to weaning: use 50 g of dry Ecopiglet per litter daily to prepare piglets’ digestive system for the challenges of weaning. Give your piglets Ecopiglet starting from their 5th day of life until weaning in order to prepare their digestive system to the challenge of weaning. Ecopiglet can also be administered as a liquid if mixed with water. Put a shovelful of Ecopiglet on the piglets’ mat every day. The product will appeal to them, so they will go and eat it daily. 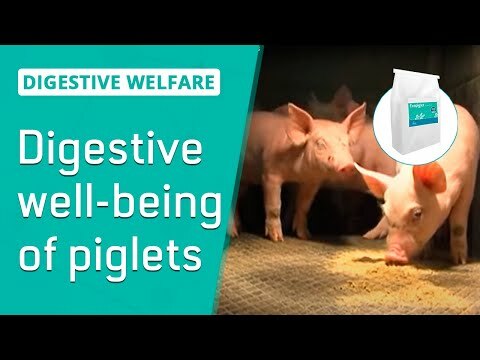 Ecopiglet also contributes to the suckling of pre-starter feed, hence to the increase of their weight on weaning. Mustapha Berri from INRA Nouzilly gave a speech entitled “Sulfated polysaccharides-rich extract of Ulva armoricana green algae exhibits an antimicrobial activity and stimulates cytokine expression by intestinal epithelial cells”, a work conducted with Olmix Group.